This extensive data product includes the contact information of individuals at admissions departments of several different companies, colleges, and institutions. If you want to reach out to admissions staff, directors, and professionals, pull this accurate, verified contact information now. Quickly pulling an email address list of the admissions departments of several institutions is easier and faster than ever with Bookyourdata.com. Use this ready-to-download directory to find the key points of contact in admissions departments and pull important contact information like emails, phone numbers, addresses, titles, names, and more. 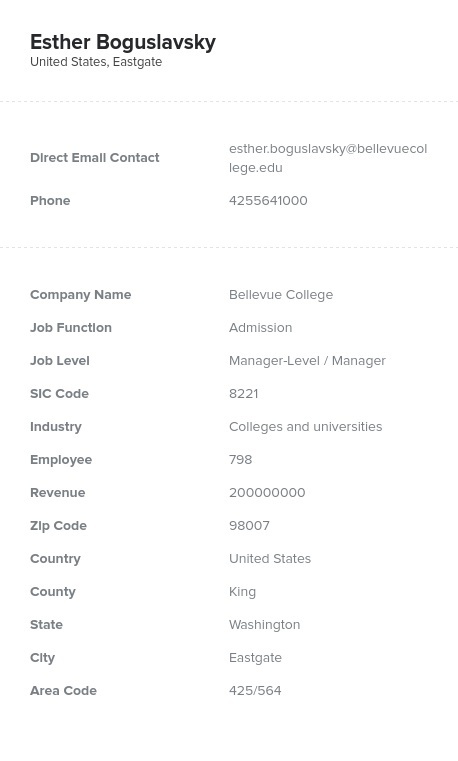 As a list of college email addresses, this data product can help networking business-to-business marketers, browsing seniors, and data analysts. It also provides a more robust lead list for really getting the conversation started. Remember that we don't sell generic email addresses (such as [email protected]). We only provide name-based emails, meaning that you'll be able to get in touch with admissions directors and staff directly. That personalized communication is integral to your success, whether you're networking with professionals, marketing a product, or simply asking for more information. Our college email address list of real human beings is also human-verified, meaning that the data has a higher accuracy than many competitors'. Bookyourdata.com offers the best cost-to-quality ratio. We can help you make real connections with those in admissions departments. Download this integral college email address list, or customize your data solution using our list-builder tool. Get started with contacting the right people today.